If you are new to car audio, choosing the right component subwoofer can seem like a challenge, with so many subwoofer options out there. How can you decide which one is the best for YOU? The easy route is to choose a loaded and amplified subwoofer package (subs are already matched and mounted with a perfectly matched amplifier already built-in). Just wire and rock! But if you prefer the high performance or custom design of a compnent sub, read on... There are thousands of options in different brands, sizes, power handling, voice coil configurations, etc. A woofer with the highest power handling has to be better than one with a lower rating. Not necessarily. A woofer with dual voice coils has to be better than one with a single voice coil. Not always. A 15" subwoofer has to be better than a 10" subwoofer. It depends. Subwoofers are a necessary component of any good sound system. No other speakers can reproduce the low frequencies necessary to experience your music the way the artist intended. Whether you listen to rap, rock, metal, or country... Whether you listen to your music loud or quiet… subwoofers will improve your overall listening experience with the feel of a live concert. There are multiple factors to consider when deciding what subwoofer is right for you. Depending on your answers to the following questions, the right subwoofer for you may not be the right subwoofer for your buddy or even your next vehicle. How much money are you willing to spend. You must consider the cost of the subwoofer, the cost of an appropriate sized amplifier to power the subwoofer, and any electrical upgrades you may need (high power alternator, extra batteries, etc…) to provide enough power to your amplifier if you choose a high power system. What are the goals for your sound system? Do you want to compete in SPL competitions? Do you want to rattle the windows of the vehicles next to you at a stoplight? Do you simply want to improve the sound of your factory sound system? The answer to these questions will help you choose a subwoofer that is right for you. How much space do you have available in the vehicle that you intend to have the subwoofer installed? The woofer itself can sometimes be fairly big and heavy and when the woofer is installed in it’s enclosure it gets even bigger. For example, if you only have 5 inches of depth available, you will need a subwoofer that has a depth of around 4.5" max. Measure the height, width, and depth of the available space and confirm an enclosure will fit in the space and the sub will fit through the opening to the space. If you plan to build your own enclosure or have your local car audio shop build one for you, make sure you can fit an enclosure that has the appropriate volume specified for the subwoofer. If you are limited on space, you may want to consider shallow mount / thin subwoofers that are built specifically for limited space applications or maybe a vehicle specific subwoofer system that has a custom built enclosure designed to fit in a specific space in the vehicle. Another option is to buy an enclosed model that will fit in your trunk without access through the deck. Remember that bass travels through walls in all directions. In the world of subwoofers, there are many misconceptions. Some people think that the higher the power handling the better the subwoofer. Or the bigger the magnet is, the better the subwoofer will perform. These determinations are not so simple because there are many other factors to consider. This article is not intended to explain ALL of the technical aspects of choosing a subwoofer. But it will help a novice car audio enthusiast with the process. Once you have decided on a size and budget, there are some key subwoofer specs to consider when researching subwoofers. These specs will help you analyze the performance of the subwoofer and determine which is the better option for YOU. Power — If you want a system that really booms, there's no substitute for plenty of power. Pay attention to RMS power ratings, not peak or max power ratings. RMS ratings measure continuous power handling or output and are a much more realistic measure of the amplifier's actual capabilities. 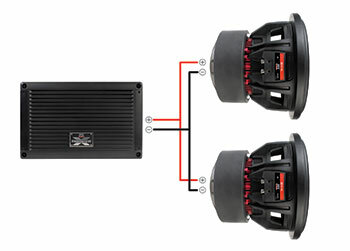 Make sure you match the sub's power handling to your amp's power output. Sensitivity — Sensitivity goes hand-in-hand with power to achieve high output. A sub that has a higher sensitivity rating requires less power to produce the same volume of sound as a model with a lower sensitivity rating. This is very important to consider because a subwoofer rated at high power handling and rated low in sensitivity is less efficient than a subwoofer with a lower power rating and a higher sensitivity. The best option will be the highest spec of both. Frequency range — Frequency range gives you an idea of how low a note a sub can reproduce accurately. Keep in mind, the actual performance of the sub will depend on a lot of variables including the box type it's mounted in and whether or not the box has the appropriate volume and/or port tuning. Enclosure type — The type of enclosure a sub is mounted in will have a large effect on the type of sound it produces. In general, sealed boxes give you the deepest, most accurate sound, while ported enclosures produce more volume from the same component subwoofer. Number of voice coils — Dual voice coil subwoofers are a popular choice among car audio enthusiasts who want more flexibility in wiring their sound systems. While typical subwoofers have a single voice coil, dual voice coil (DVC) subwoofers use two separate voice coils, each with its own connections, mounted on one cylinder, connected to a common cone. But dual voice coils do not affect the sound output and they cannot handle double the power of a single voice coil subwoofer. Size of the woofer — Size is a never-ending question — what size subwoofers play loudest and lowest? It's not an easy question — you need to consider sensitivity, enclosure type, and available power. If your ultimate goal is to have a system that plays loud and low, and space isn't an issue, go for the biggest subs, but don't underestimate smaller subs. Properly powered and in the right enclosure, smaller subs can put out plenty of sound. Impedance — Subwoofer power ratings are calculated at a specific impedance. It is EXTREMELY important to ensure that your system configuration is matched appropriately to the power provided by your amplifier at your system impedance. There are a wide variety of amps available, so you shouldn't have any trouble finding one that will bring out the best in the sub you've chosen. 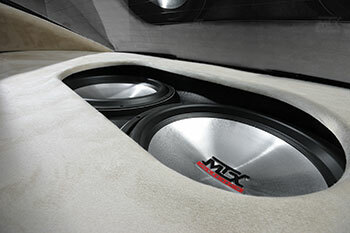 Volume Displacement – Volume Displacement is to a subwoofer what horsepower is to an engine. Volume displacement is the amount of air a subwoofer can move during the standard movement of the cone and is calculated by multiplying surface diameter by xmax. Look for subwoofers that display this information. Once you have determined what kind of system you want to create, considered how much space you have available, and how much money you want to spend, the only thing left to do is match up your subwoofer or subwoofers with an appropriate amplifier. To do this, you need to consider power ratings and impedances. For example, if you are going to purchase a single subwoofer system, you will need to choose a voice coil configuration that will match up the appropriate power from your amplifier. If an amplifier has an RMS power rating of 500 watts @ 2ohms or 250 watts @ 4ohms and the subwoofer you choose has an RMS power rating of 500 watts, you will want to make sure you can wire your subwoofer at 2ohms. Subwoofers are available in single or dual voice coil configurations. The number of subwoofers you are wiring together and whether they are dual or single voice coil configurations will determine what your final load or final impedance will be. For example, if you have 2 subwoofers that are dual 4ohm voice coils, your final impedances can be either 1ohm or 4ohm at the amplifier depending on how you wire them. If you have 2 subwoofers that are single 4ohm voice coils, your final impedance can either be 1ohm or 8ohms depending on how you wire them. To be certain you are matching up your subwoofers at the proper impedance with an amplifier that will provide them with appropriate power at that impedance, you can find all of our wiring diagrams at Library - Wiring Diagrams. Here you will find a variety of diagrams that will help to ensure you wire your subwoofers properly to get the final impedance you need for your amplifier. After considering your space limitations, your budget, and the type of system you are trying to build, you have researched the specifications of the subwoofers that fit into your criteria, and you have chosen a single subwoofer or numerous subwoofers that have the correct voice coil configuration and impedances to match up to a final impedance that will allow your amplifier to provide the proper amount of power, you are all set. The process of choosing all the necessary components and ensuring they will work properly with each other can be an intimidating process but if you follow our guidelines and compare using the criteria we have outlined, you can have confidence that your money is being well spent. If you have any questions call our MTX Techs anytime at 1-800-225-5689, email at support@mtx.com or chat at MTX.com.